To better manage your order, Yandex.Direct can send you messages concerning the status of your advertising campaign. By default, the notifications are sent to the address you provided when registering with Yandex. Optionally, you can change the email address. You can also enter a separate email address for each campaign. The email address for notifications needs to be changed in the user settings and in the campaign settings. The User settings link is located to the right of the ad campaign name on the My campaigns page. Add a new contact email address and save your changes. On the campaign settings page in the section Notifications → Email notifications click Edit, enter a new email address and save your changes. If your email address is already registered for notifications, then you can select it under "User settings" or "Ad campaign settings". Notifications are not sent to all registered email addresses, only to the one which is currently selected. To receive notifications at two different email addresses, you can enter one of them as your main one in the "User settings", and the other one in the ad campaign settings. This can be done, as described above, in the Change notification address section. It is technically impossible to unsubscribe from all Yandex.Direct notifications. We believe that it is vital to promptly notify advertisers about account transactions and the results of control checks in order to ensure that their campaigns are running smoothly. What notifications can be disabled? To turn off such notifications, you must edit the information in your "User settings" and in the campaign settings. The User settings link is located to the right of the ad campaign name on the My campaigns page. Disable the Get notifications about changes in traffic volume option and save your changes. On the campaign settings page in the Notifications → Email notifications section, click Edit, uncheck the Change traffic volume box and save your changes. Notifications about stopping upon reaching daily budget. Notifications on preparedness of XLS reports. On the campaign settings page in the section Notifications → Email notifications click Edit, uncheck the necessary boxes and save your changes. Yandex.Direct automatically checks URLs for accessibility whenever you create or edit an ad. If a page is inaccessible or doesn't respond for more than 7 seconds, you will see an error notification. An ad containing this link cannot be saved until the issue with your site has been resolved. If the URL specified in the Web Link field leads to tags, in the ad it will be replaced with the domain of the first redirect after the tag. The domain you specify will be displayed in your ad in all other instances. While checking advertising materials, the Yandex.Direct robots may download the page specified in the Link to site field, or the end landing page, even if they are restricted from indexing in robots.txt or meta tags. If there's a large amount of advertising material on your site, the restriction of the Crawl-delay directive may also be exceeded. The Yandex robot with useragent Mozilla/5.0 (compatible; YaDirectFetcher/1.0; Dyatel; +http://yandex.com/bots) is used to check the website availability. Yes, you can do this in the campaign settings page. You can also delete all identical contact information for all ads at once. 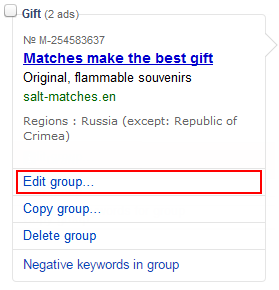 Create a group consisting of different ads, but with all the same keywords and bid amounts. The system will display all the ads from the group in random order, and after some time it will display the ads with a higher CTR forecast for the specific impression more often. From your campaign page, go to the All groups tab: there you can edit all your ad groups regardless of their status. Please click the Edit group... link. On the Edit ad group page, you may edit the existing ads or add new ones. A group may contain up to 50 ads. By clicking the Edit group... link on the Active tab, you will be able to edit only the active ads in the group. The same applies to the other tabs: Under moderation, Rejected, Discontinued, Drafts. 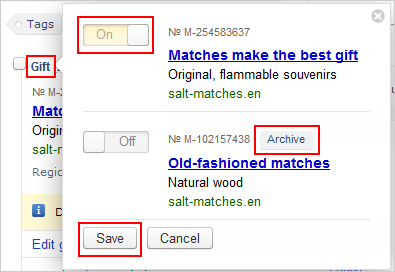 Read about how to remove campaigns or ad groups in the How to delete campaigns or ad groups section. To edit several ad groups, check their boxes on the campaign page, and then cselect Edit at the bottom of the page. A page will open where you can make changes to the ads, keywords, or other settings across all the groups you selected (either one by one or by using the the Mass changes button). Note. By clicking the Active tab, you will be able to edit only the active ads in the selected groups. The same applies to the other tabs: Under moderation, Rejected, Discontinued, Drafts. You can edit all your ad groups under the All groups tab. To perform any action with separate ads in a group, click the group name. After completing what you wanted, please click Save. To cover all the ads in the group, click the appropriate links. The action will apply only to those ads where it is permitted, e.g., you may archive only ads that are discontinued and drafts. Ads that have been discontinued for more than 30 days are archived automatically. 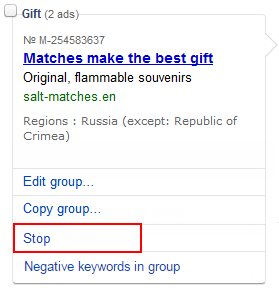 Click Delete under the campaign name or Delete Group under the name of the ad group. If the link doesn't appear in the interface it means that the campaign or ad group was active at some point (i.e. the status was Campaign in Progress) and it's not possible to delete them. In this case you can move campaigns that are no longer running to the Archive tab so that they don't distract you from managing your active ads. Just click on the Archive link under the name of the campaign. In most cases, the campaigns being automatically removed are currently stored in your archive as drafts. To save such campaigns for the future, simply unarchive the campaign and top up that campaign or the shared account. You cannot add images if you are accessing Yandex.Direct from a mobile device. Please add images from your desktop or laptop computer. Please describe in detail the difficulties you encountered when adding images. If possible, please attach a screenshot. You can set the start date for your campaign on the campaign settings page. Automatic campaign launching will not work if, previously, the campaign had been manually stopped. The number of keywords per group cannot exceed 200. The number of characters for one keyword (including negative keywords) cannot exceed 4096. Combination “-!” is counted as one character. The number of words in one keyword cannot exceed seven, excluding stop words. Note. If there is a “!” or “+”in front of a stop word, it is no longer considered a stop word. A list of negative keywords can contain up to 4096 characters, not counting spaces. The number of words for one keyword cannot exceed seven. A list of negative keywords can contain up to 20,000 characters, not counting spaces. The number of words for one keyword cannot exceed seven. Every ad campaign can contain up to 1000 groups. Each group can include up to 50 ads. It is possible to place up to 3000 campaigns on one account, of which no more than 1000 can be active (active campaigns are considered to be all campaigns not located in the archive). Since August 3, 2017, Autofocus became integrated as part of Yandex.Direct's algorithms. Autofocus and the option to add negative keywords will no longer appear in the interface. Email notificationsEdit adsHow to delete campaigns or ad groupsCannot add imagesAdvertising start dateQuantitative restrictionsWhere is autofocus?